I finally received my Artefact Cards last week and I love them. They were a pain to get hold of due to a spectacularly inept delivery company but Artefact soon rectified this when I e-mailed them to complain. They’re probably only likely to appeal to those with a real stationary problem but if you too find yourself fixated on Moleskine notebooks and their ilk then I suspect you will like them every bit as much as I do. The idea behind the cards is to materialise ideas. This is a concept that appeals to me immensely. One of the weirdest experiences of my life was the first time I printed out my PhD thesis. Suddenly the ethereality which had recurrently seeped into every part of my life over the past six years was transmuted into a thing… it was just some stuff that I had written. This was a more intense form of a feeling that I often get when writing. Getting the words out into the world, giving them a form, somehow makes my mind feel lighter, even if that form is digital. The idea becomes something ‘out there’ rather than ‘in here’, with a definite form rather than a potential range. I’m already finding them immensely useful. In the cards below are the talk I’m giving at the Digital Sociology conference in New York in a couple of weeks. I recorded everything I wanted to say on its own individual card. I’m now going to arrange them in order to draw out clusters, perhaps discard a few and then write the talk using these cards as prompts. In this sense, it allows me to organise my ideas in a more systematic way without sacrificing the writing-to-see-what-happens approach which I prefer. I’m sure some of the prompts will be discarded, others will be rethought and all of them will exceed the limits of what I placed on the card itself. I find this immensely enjoyable and blogging is the apotheosis of it for me. However in the last couple of years, I’ve taken this too far and I’m trying to reintroduce structure into the process. Overly-enthused by the discovery that I can write pretty endlessly about subjects that I’ve thought a lot about, I submitted a series of journal articles that were basically 7000 word blog posts. 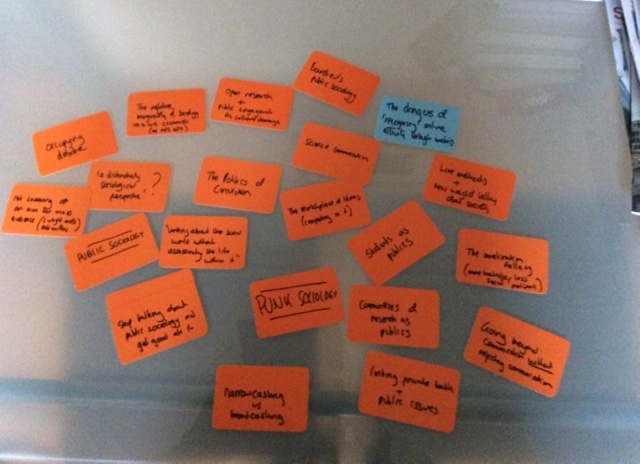 The responses weren’t actually that bad but they were uniformly requests for major revisions and the experience made me realise that I need to introduce much more discipline into my academic writing and this is what the Artefact Cards seem to be helping with already. I need to develop ideas in a more sustained way, producing more tightly argued and well integrated scholarship, without sacrificing the creative side of the process that I enjoy so much. In other words, I have lots of ideas but I need to learn to develop them much more systematically in order to produce journal articles of the standard which I’d like to. I’m setting myself 500 word writing assignments for Social Media for Academics. I’m going through the book as it currently stands and recording every idea I have about something that should be added in. I’m going to take some of the ensuing cards in my wallet whenever I travel so that I can do brief bits of focused writing on my iPad on the train. I have close to 100 cards now which record every idea I have about the acceleration of higher education for the project I’m doing with Filip Vostal. I did hit exhaustion point with the cards and that was interesting. I had a very definite sense that “this is everything I think about this subject” and I’ve had no further ideas since (whereas with others, ideas keep occurring to me). It’s presented me with the limitations of what I have to say about the subject but also left me with a more clearer sense of what I do want to say, even if it’s not quite as expansive as I thought it was. I’m going to use these cards to do some prompted blogging on accelerated.academy, consult them when planning the conference and use them as a source of ideas in the writing we’re doing. I have a stack of cards for the large post-doc project that is starting to take shape in my mind. This is much more provisional and I only have 20 or so cards thus far. This has left me aware of how much more work I need to do because the ideas on the cards are very general. I’m going to try and develop these in clusters: going from an idea like ‘cognitive triage’ to develop many other related notions. I plan to add to these over time and hopefully by the time I start putting together a grant application at the end of the year, I’ll have a much more concrete sense of the planned project than I do at present. These are just a few ideas I’ve had in less than a week of owning the cards. I’m sure I’ll have many more. Though I’ve almost finished a £36 box of cards since then, it’s been a really useful experience and left me with a much greater degree of purchase upon the projects I’m in the process of developing. I doubt this intensity of usage will be the norm but I’m certain that Artefact Cards will be a regular part of my working life from this point onwards.